How to use while loop in C# programming? To become expert programmer from novice, you need to completely cover the looping segments. The loop is very important in every programming language that saves you from repetitive nature of work. The C# supports While, do while, and for a loop. However, you can also use foreach and goto statement for looping. 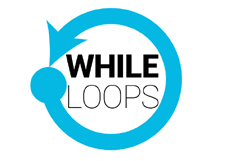 The while loop is one of the important looping constructs, that is being widely used in C sharp programming language. To understand the concept of while loop, consider the following diagram. In the above example, three things are important. These are the important characteristics of any loop. Initialization represents the starting position from there your loop will be started. In the above example int i=0 refers to initialization of while loop. i++ refers to increment/decrement and finally while(i<10) refers to the termination of while loop. Each time the while loop executed, it checks for condition whether the value of i is less than 10 or not. If the value of i is less than 10, the loop will be executed and increment i by one and then print the value of i. When the value of i reaches 10, the while(i<10) condition becomes false and terminates the loop. To understand more clearly while loop, study the following example that print table of given number using while loop. Sometime, you don’t know the starting position of loop but want to execute some code in while loop. Or, you might want to run infinite loop that will be terminate with special character. In this situation, you can use while(true) as infinite loop. In this chapter you learned in details about while loop. You also learned what is while (true) loop and how to use it in C# programming. 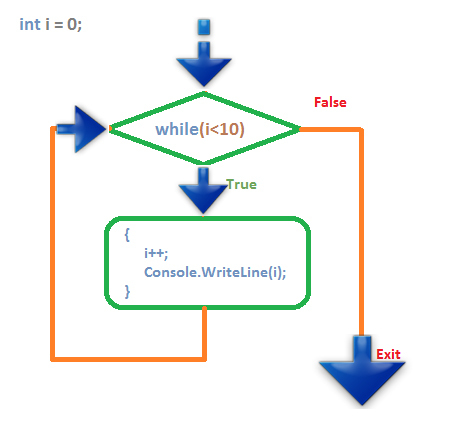 In next chapter you will learn about do-while loop in C#.